Researchers are already starting to ask, How can my research be more FAIR? 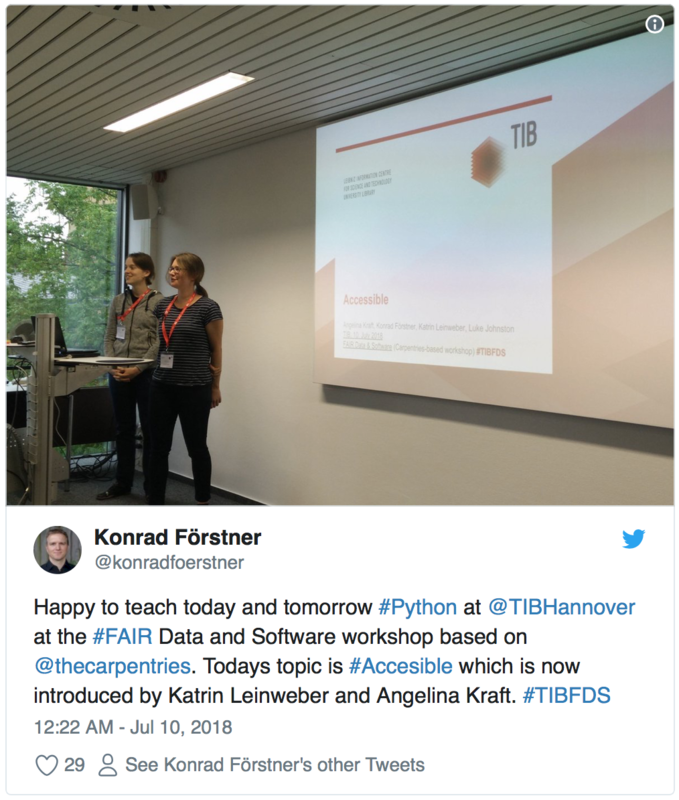 Thanks to Angelina Kraft (team lead, research data and scientific software) and Katrin Leinweber (research assistant) at TIB Hannover, we have a headstart on developing a training program for the research community on FAIR Data and Software. Angelina and Katrin were joined by Carpentries instructors Konrad Foerstner (ZB MED – Informationszentrum Lebenswissenschaften), Martin Hammitzsch (Das Helmholtz-Zentrum Potsdam Deutsches GeoForschungsZentrum), Luke Johnston (Aarhus University), and Mateusz Kuzak (Dutch Techcentre for Life Sciences) in contributing to the workshop lesson materials and notes. These can be found at the workshop website while the slides can be viewed at the 2018-07-09-FAIR-Data-and-Software-TIB-workshop Google Drive folder (or as PDFs). All the materials are openly shared in the hopes that others will reuse and develop them further. Video recordings will also be available at the TIB AV-Portal. In addition, I and other participants tweeted non-stop to document the workshop for others following along remotely via the hashtag #TIBFDS. Katrin (left) and Angelina (pictured above) demonstrated that you can successfully pair background information on the FAIR Principles with the hands-on examples taught in The Carpentries. For others hoping to better prepare for FAIR and train their communities in the principles, the TIB Hannover workshop serves as an excellent starting point. I know a number of us in Library Carpentry will be working with Angelina and Katrin to further develop their material.